Our Leadership Institute, much like corporate leaders such as Google, Apple, Chase, and the U.S. Department of Defense, is setting a new standard for higher education overseas by incorporating daily mindfulness training into nearly all of our programs. CIMBA academic programs are designed to provide students with the foundation to thrive in a global business environment. Whether you are pursuing study abroad, an MBA, or our Executive Programs, you will go beyond theory and practice. You’ll gain hands-on, real-world experiences from prominent guest speakers, knowledgeable faculty who have lived and worked around the world, and company tours of multinational corporations and small Italian businesses. Our English-speaking professors come from more than 35 top universities throughout the U.S. and Europe. These professors tell us CIMBA’s small, personal teaching environment allows them to build lifelong connections with students. All of our programs are infused with an innovative leadership and personal development program that is supported by one of the most comprehensive, highly personalized, one-one-one coaching programs in the U.S. and abroad. All of our coaches follow the International Coaching Federation code of ethics in performing their coaching responsibilities. Our semester and summer study abroad programs for undergraduates have the power of the University of Iowa Tippie College of Business accreditation behind them. 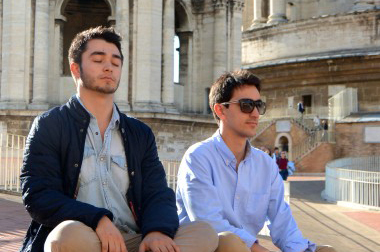 Our semester students spend 12 weeks at CIMBA, earning between 12 and 18 credits, and enjoy more than 25 days of open travel to explore Italy and Europe. Our two-course, four-week summer program allows students to earn six credits and embark on two long weekends of travel. Graduate students can complete up to two courses in the summer, earning three credits in a two-week session or six credits over four weeks. Course topics rotate, but have focused on areas such as business fraud, sustainability, and leadership and personal development. Students also network with international business leaders who are guest speakers in the classroom, take company tours, and study and travel side by side with students who come to CIMBA from around the world. Study full-time and earn an accelerated MBA degree in 11 months or study part-time and earn an MBA in 22 months. Both our Full-time and Part-time MBA Programs begin on our Paderno del Grappa campus, where students are immersed in coursework and seminars, including topics such as economics, new venture development, global marketing, production and operations, and leadership and personal development. In the final month of their program, our graduating MBA students travel to the University of Iowa Tippie College of Business in the U.S. to complete a real-world business simulation course that incorporates all aspects of their MBA studies. While in the U.S., students also get an inside look at American companies and receive their degree at a formal University of Iowa College of Business graduation ceremony. Our broad range of Executive Programs are ideal for managers and executives working in Italy and the surrounding area who don’t have the time or interest to pursue an MBA, but would like to increase their knowledge. Classes meet on weekends, so you can fulfill your work responsibilities during the week. We offer Executive Certificate Programs, Short Courses, and In-Company Training.